Is determining your investment allocation by using the "100 minus age" rule a smart approach to investing your retirement money? Research indicates this rule of thumb may harm you more than it helps. Probably the largest investment decision you'll make is your asset allocation. This is how much of each investment type, stocks vs. bonds, you'll hold in your portfolio at any given time. Over the years many rules of thumb have developed in an attempt to provide guidance on this decision. One such popular rule is the “100 minus age” rule, which says you should take 100 and subtract your age: The result is the percentage of your assets to allocate to stocks (also referred to as equities). Using this rule, at 40 you would have a 60% allocation to stocks; by age 65, you would have reduced your allocation to stocks to 35%. In technical terms, this is referred to as a “declining equity glide path.” Each year (or more likely every few years) you would decrease your allocation to stocks, thus reducing the volatility and risk level of your investment portfolio. This rule assumes that financial planning is the same for everybody. Investing decisions should be based on your financial goal, your current assets, future income potential, and any number of additional factors. If you are currently 55, and not planning on taking withdrawals from your retirement accounts until you are required to do so at age 70 1/2, then your money has many more years to work for you before you’ll need to touch it. If you want your money to have the highest probability of earning a return in excess of 5% a year then having only 50% of those funds allocated to stocks may be too conservative based on your goals and time frame. On the other hand, you might be 62, and about to retire. In this situation, many retirees will benefit from delaying the start date of their Social Security benefits and using retirement account withdrawals to fund living expenses until they reach age 70. In this case, you may need to use a significant amount of your investment money in the next eight years, and perhaps a 38% allocation to stocks would be too high. Academics have begun to conduct retirement research on how well a declining equity glide path (which is what the 100 minus age rule will deliver) performs compared to other options. Other options include using a static allocation approach, such as 60% stock/40% bonds with annual rebalancing, or using a rising equity glide path, where you enter retirement with a high allocation to bonds, and spend those bonds while letting your stock allocation grow. Research by Wade Pfau and Michael Kitces shows that in a poor stock market, such as what you might have experienced if you retired in 1966, the 100 minus age allocation approach delivered the worst outcome, leaving you out of money thirty years after retirement. Using a rising equity glide path where you spend your bonds first delivered the best outcome. They also tested the outcome of these various allocation approaches over a strong stock market, such as what you might have experienced if you retired in 1982. In a strong stock market, all three approaches left you in good shape with the static approach delivering the strongest ending account values and the rising equity glide path approach leaving you with the lowest ending account values (which were still far more than you started with). The 100 minus age approach delivered results right in the middle of the other two options. When you retire, there is no way of knowing whether you will be entering a decade or two of strong stock market performance or not. It is best to build your allocation plan so that it works based on a worst-case outcome. As such, the 100 minus age approach does not appear to be the best allocation approach to use in retirement as it does not fare well under poor stock market conditions. 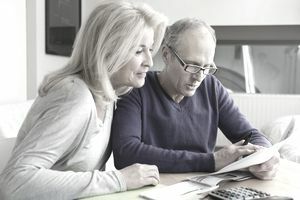 In lieu of allocating portfolios this way, retirees should consider exactly the opposite approach: Retiring with a higher allocation to bonds that can be intentionally spent, while leaving the equity portion alone to grow. This would most likely result in a gradual increase in your allocation to equities throughout retirement. There are a lot of asset allocation strategies, but the best strategy takes into account a variety of factors, all of which are important to consider. Financial planners use programs that calculate your retirement needs based on your current and projected financial picture. Although the models you find online may give you very general guidance on how to deploy your financial resources, financial planning is something to leave to the experts--or at least get an expert opinion tailored to you.